The worth of the child cannot be measured in terms of "Per Cent" alone. The home life of the child is an important part of the whole life. The teacher's judgment will be a much better one if the home will kindly co-operate. Parents are asked to carefully consider and mark "Home Report" as indicated. 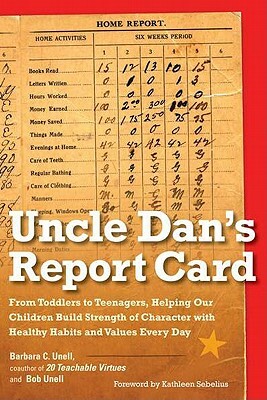 With the discovery of their Uncle Dan's school report card from 1914, in which a "Home Report" section of the card was to be completed by parents, Barbara and Robert Unell were inspired to explore the behaviors and values upon which students were "graded" in addition to the standard academic subjects. They realized that these surprising entries, ranging from acts of kindness and truthfulness to personal habits and reading for pleasure, were as timeless and relevant today as they were almost a century ago. Uncle Dan's Report Card gives every parent and caregiver not only a reminder of the worth of these values and behaviors but also a practical means to encourage children to recognize and practice good habits. This book provides the positive, proven tools they can use with toddlers to teens to help them be successful and happy in their everyday lives, personally and academically.